The structural organization of brain circuits. Additional collaborative research: 1) The neurobiology of ingestive behavior (with Dr. Scott Kanoski); 2) Mouse brain architecture (with Dr. Hongwei Dong). My field of research is systems neuroscience (the structure and function of neuronal circuits). Within this broad field, my main research interests are 1) neuronal network architecture, and 2) the structure and function of specific neuronal circuits (especially hypothalamic) involved in the control of physiological and behavioral processes that support survival and reproduction. 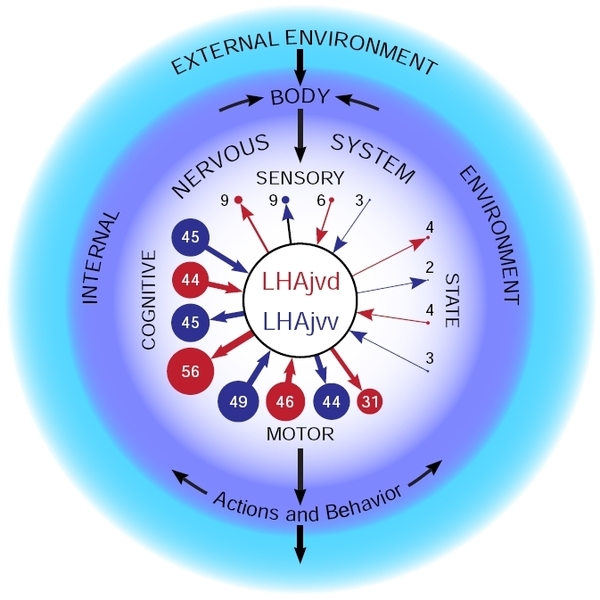 The image shown above (from Hahn & Swanson 2015) represents the overall connectivity of two regions of the hypothalamus with the sensory, state, cognitive, and motor subsystems of the nervous system. Underlying this summary diagram are data obtained from pathway tracing experiments. See the referenced article for further details (weblink below in Selected Publications). Interested NGP students, please note: As a current Associate Member of the NGP Training Faculty, I am available to co-mentor students with faculty colleagues who are current full members. If this may interest you, please first approach the latter. PhD in Neuroanatomy and Neuroendocrinology (King's College London, UK, 2004).